Attention, lovers of artful bijoux: Milanese fine jewelry maker Pomellato has just opened its first Canadian standalone store in Vancouver's Pacific Centre. Despite Pomellato's little-known status in North America, the artisan-driven label has a huge following in Europe thanks to its winning combination of Old World craftsmanship, modern innovation, and warm organic shapes. No wonder Pomellato counts the likes of Oprah Winfrey and Sofia Coppola as fans! If you're planning to check out the Vancouver store, keep your eyes peeled for these pieces. 1. These Nudo Petit cocktail rings in a variety of candy colours look good enough to eat. 2. A statement necklace with oversize gold links, like this one from the Arabesque collection, is a nouveau classic—especially with that filigree work. 3. If you're getting an engagement ring for an unconventional bride-to-be, these Sabbia rings, with their multicoloured diamonds and sand-like settings, are a cool alternative to a classic solitaire. 4. The Capri strand necklace features turquoise and rock crystal custom-cut to be exact matches, and then set back-to-back to create a texture and colour reminiscent of sparkling blue Mediterranean waters. 5. 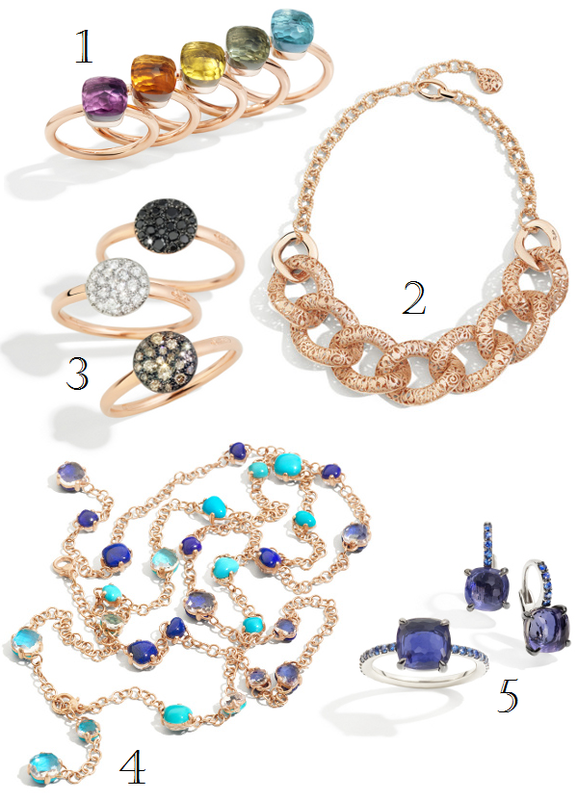 Match your earrings to your ring (like this set from the Baby collection) for instant understated chic. They're beautiful in person. Pomellato uses a very subtle shade of rose gold in their settings that's universally flattering to boot.